Yes, I know that I usually never swatch anything. Or I swatch for an inch and call it good. I’m not fond of swatching, and I can usually come pretty close to gauge. Usually. You will remember from my previous post that I had mysteriously obtained a pattern and some Malibrigo Lace in the aptly named Purple Mystery colorway. I wanted to start this shawl in the same way that a bear when she wakes up in the spring wants a little snack. And I was just about as cranky because I am trying to stay at least lace-monogamous and finish the Great Green Glob first. 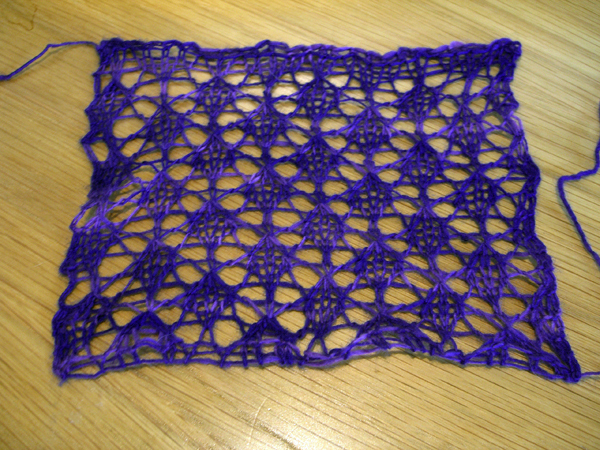 The Peacock Feather Shawl pattern includes a little stitch pattern for a swatch. The pattern has four repeats across a row, and one is to repeat four times, plus there’s a two-row/stitch garter border (total 28 stitches/row, 36 rows). The resulting swatch should measure 5″x5″ unblocked and 7″x7″ blocked. My first attempt, on the specified US#4 (3.5mm) needles measured about 4″x4″ as knit and blocked out to a whopping 5-1/2â€³ x 5-1/2â€³. (If I squint a bit. It’s not really, exactly, perfectly square.) Not what I was looking for. I really did like the stitch definition, though, and the way the yarn knit up. I’m still petting it. The picture above is attempt #2. Swatch B was knit on US#5 (3.75mm) needles, and I tried to knit really, really loose – especially on the purl side because my purl stitches tend to be tight. Now, I know that trying to knit really loosely is not exactly a smart thing to do. Eventually you forget that you’re trying to knit really, really loosely because you’re knitting when you’re a bit tired, or distracted by the TV, or enjoying a bit of wine with a few knit-buds at knit-night. And the next thing you know you’re right back to knitting with the same old normal tension and all thoughts of loose knitting have flown out the window and you now possess a knitted item that has varying gauges that resemble areas of stone or driftwood floating in a swath of nice, loose sand. The purposely-as-loose-as-I-could swatch was about 4-1/2″ high x 5″ wide and, after stretching it into within a micron of its life, harder than I’ve ever blocked anything ever, I manged to stretch it out to 5-1/2″ x 6″. Besides, I knew in my heart of hearts that I really need to knit my normal style. I don’t want any surprises, here. No driftwood amongst my peacock feathers, please. So this is Swatch C. It was knit on US#6 (4mm). It’s size pre-blocking was a respectable 4-3/4″ high and 5-3/4″ wide. Its blocked size is (drum roll please) — 5-1/2″ x 6″, or thereabouts. Exactly the same size as Swatch B. I can only tell them apart because I used a completely different cast-on with Swatch C (so I could stretch it as far as possible), and I did a sort of wonky job of blocking it because it was late and I was tired. You know that old saying about doing the same thing over and over again, each time expecting different results? So I have been petting my swatches and pondering. I found errata for this pattern, interestingly enough for the swatch. The only known error in the pattern is that the instructions for the swatch should read repeat 4 times not repeat 6 times. It has been already corrected on my copy. Although, if I’d repeated the pattern another time or two, I might have gotten the darn thing square. No help here. My next thought was to read the blogs of those who have knit the pattern. They all had the same two really interesting observations. First, the thing is the size of a circus tent. The finished measurements are 88″ across the top and 43″ down the center back. That’s a pretty large shawl. 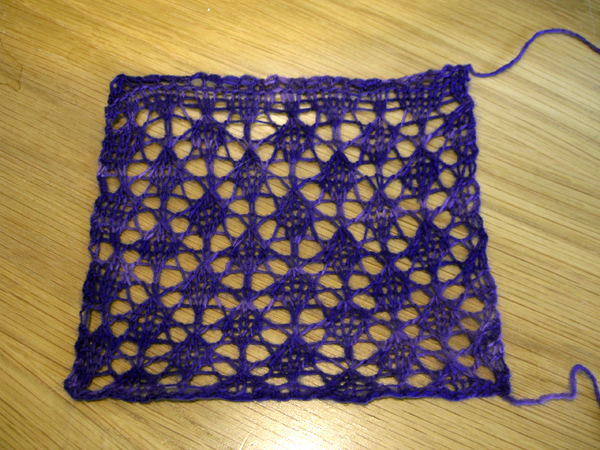 Second, nobody managed gauge, yet all of the knitters I read had managed to knit a triangle that was shawl-sized. Some had actually had the shawl block out to the pattern’s finished measurement, even though their gauge swatch was way smaller. The swatches lied, big time. So here I sit, gentle reader, in indecision. I don’t want to knit yet another swatch. I really like the stitch definition on the US#4s. But, by my calculations, that would reduce the size to around 63″ across and 32″ down the center. Unless it doesn’t, because the swatch is lying. I’m 5’3″ tall on a good day, so maybe that’s big enough (unless it’s bigger, you understand). I think a swatch on a US#5 knit at my normal gauge and falling somewhere between swatch A and swatch C would be nice, too. I’m not wild about swatches B and C. I think US#6 are a bit big for this yarn, and knitting at a looser-than-normal gauge is not a terrifically good idea for reasons we’ve already discussed.